Parmigiani Fleurier company announces the release of new watches Parmigiani Fleurier Pershing Tourbillon Abyss, presented in a circular housing with a diameter of 45 mm and a thickness of 14.2 mm. Equipped with body unidirectional bezel in 18 carat pink gold satin. On the bezel marked with Arabic numerals. Dark blue dial features overlaid hour markers and Arabic numerals, reserve indicator in the “12 o’clock” and a fabulous tourbillon at 6 marks. Sapphire crystal protects the dial with anti-reflective coating. 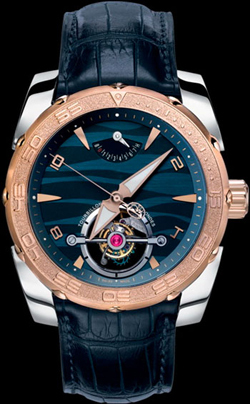 Hours Pershing Tourbillon Abyss is water resistant to 100 meters. Assembled model based manufactory caliber Parmigiani Fleurier PF510, the operation of which can be seen through the transparent sapphire crystal. The mechanism is equipped with a 7-day power reserve, as well as the functions of hours, minutes, seconds, date display.